If you really like to try any Chinese snacks, these pan-fried dumplings (jiaozi 餃子) must be on the top of your list. 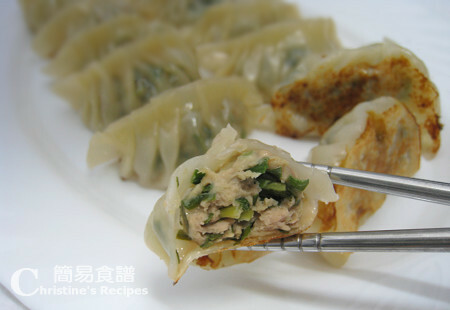 The thin and soft dumpling pastry is filled with mince pork and Chinese chives. The bottom of each dumpling is fried to be brown and crispy. They are best served with black vinegar dipping sauce, and/or chili paste with soy sauce. Kids in many Chinese families, especially those who are living in northern provinces of China would learn how to wrap dumplings at home from a very early age. It’s quite amusing to watch kids wrapping dumplings. They would first pick those dumplings they wrapped, eating with a great satisfaction. There are many different ways of wrapping dumplings. Some are practical, some really artistic. I posted a video below showing how to wrap a dumpling easily and beautifully. I learned this method of wrapping dumplings from one of my Peking friends. Basically, you can just seal the edges of dumplings and make sure not to let any fillings leak out when cooking. That’s it. When it comes to eating dumplings, flavours and taste always come before the looking. Why not make some for your family or with your family if you haven’t tried before? Wrapping dumplings is fun. Rinse chives and pat dry with kitchen papers. Chop into small pieces. Mix mince pork with seasonings well and combine with chives thoroughly. Chill in refrigerator for 30 minutes. Heat up a bit of oil in a non-stick frying-pan. Place dumplings in a single layer without touching with each other. Fry them in batches until the bottom is light brown. Add 1/4 cup of boiling water, cover with a lid and cook until the water dries up. Dish up and serve with soy sauce, chili sauce or vinegar. 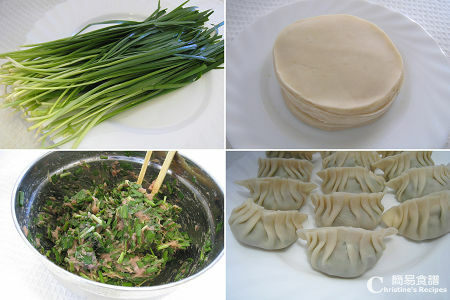 Previously I posted the recipe of Chives and Minced Pork Buns. 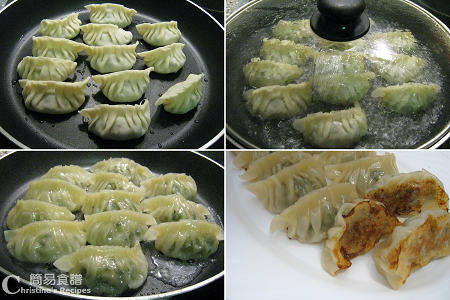 The buns are like these pan-fried dumplings except their skins are a bit thicker. The taste of them is very delicious. Fried dumping... one of my favourite, especially those sell in Dim Dum restaurant! This is great! My favourite dim sum dish! It's even better fried! Use a tab of water or egg white to moist the areas before folding the pastry. It seems that more people like fried dumplings than those in soup. Just use a bit of water to damp the edge of dumpling pastry, it will stick together very well. You are so skillful in wrapping your dumplings! Looks better than those in the Chinese restaurant. Thanks so much. Your comments made me feel so thrilled. Wow your dumplings are folded so perfectly. Mine always turn out a bit asymmetric. I'll have to try folding them from the center next time (I usually start from one end). Very good observation. Always start from the center, it's much easier to wrap a symmetric dumpling. These look amazing. Can you use wonton wrappers for these? The wonton wrappers worked a treat! Since they were square and I wrapped them diagonally, I had a bit more excess pastry at the top but they were delicious. I guess I could try using a cookie cutter to make the wrappers round or make rectangular dumplings :) Thanks for your wonderful recipes. can i use won ton wraps instead of the dumpling wraps? Wonton wraps are not good for making this kind of dumplings. Hi Christine. Well, the dumpling's looks very yummylicious. I wonder i could try to make it one of these days. In M'sia(Ipoh), easily can find wanton wrappers but not for dumpling wrappers. I think those dim sum restaurant, they make themselve. Really appreciate if anyone could give any info how to get this dumpling wrappers. Do you have a good, easurecipe and photo's of making the pastry yourself? Can I use other fillings? Such as chicken mince instead of pork? Sure, you could use any meat you like. Even just vegetable is still good. Hi Christine, can we omit thr chicken powder or replace it with something else? Chicken bouillon powder is to enhance the taste. If you don't have any, you can skip it. Hi Christine, can i boil them instead of fried? Sure, you can boil them. I sometimes do the same.